Flossing is a key component of top-notch oral hygiene according to our 5-star Boonton NJ orthodontist. Not only does it remove unsightly food and plaque from between your teeth in the short term, but it also prevents tooth decay and gum disease in the long run. If the benefits of flossing are so awesome, though, then why do you experience sore gums when doing so? Our orthodontist in Boonton has the answers! One of the most common reasons for gum soreness and bleeding after flossing is simply the fact that you may not be doing it enough. If your gums are not used to being cleaned, they will be sore at first. Much like the soreness your muscles experience after first working out, the discomfort is temporary and will result in further strength and tolerance. If a few weeks have passed and you find that your gums have not yet adjusted, it also may be that you are not flossing gently enough. You may think that the harder you scrape and prod, the more plaque will be removed. However, our orthodontist in Boonton NJ assures you that regular, mild flossing is much more effective than aggressive spurts. Also consider your flossing technique. Remember that the goal is not to dig into the gums, but rather rub against the surface of the tooth. Focus your efforts on cleaning the tooth, and contour the sides as needed. In some circumstances, sore gums may be a symptom of gum disease. This can take the form of gingivitis or periodontal disease. However, flossing regularly now can help prevent gum disease from developing later. In fact, not only can flossing be a preventative measure, but it can also work to reverse early gum disease. If symptoms of sore gums persist, do not hesitate to call our orthodontic office in Boonton NJ. Our Boonton orthodontist is happy to schedule a consultation and determine the root issue of your discomfort. For example, women may experience hormonal changes during pregnancy, menstruation, or menopause that can result in sore gums. Nicotine from smoking also often results in gum inflammation. 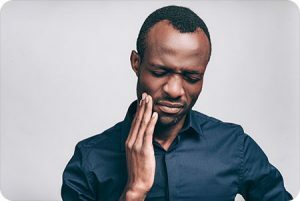 Lastly, sore gums can be a side effect of various medications and medical conditions, so be sure to contact our 5-star Boonton NJ orthodontic office if you have a concern. The information provided in this article is not meant to be medical advice and is for educational purposes only. If you would like to learn more about this and other topics related to orthodontics, feel free to contact Caggiano Orthodontics, with a convenient orthodontic office location near Boonton NJ, by clicking here or by calling 973.887.8780.